Why Are Patio Doors Important? Unlike other kinds of doors, patio doors have certain functions that are unique to it. It serves as the main portal that links the outdoors (your patio) to the interior of your home. The patio door also serves as a barrier to deter would-be trespassers from getting inside. One of the best ways to create a smooth transition to the outdoors and vice versa is to use large doors. Our French doors are popular because they create a very wide opening when both panels are fully opened, allowing for uninterrupted movement from one side of your home to another. Patio doors are well known for having a lot of glass panels. Paired with glass walls, our sliding patio doors can create a transparent layer that provides a good view of the outdoors, almost looking like they’re not even there in the first place. The bigger the glass panels are, the more seamless the transition from the patio to the indoors will look like. A great way to further enhance the transition from the patio to indoors is to keep the floor as level as possible on either side of the door. This is not doable in certain cases like when there is a door threshold. Fortunately, this can be remedied by having a recessed floor at the edges, so you don’t have to step over something to pass through the door. This option works for either French or sliding patio doors. Are you ready to have that seamless transition from your patio to the rest of your home? Call us at (314) 332-2364, or fill out our contact form to request a free estimate. 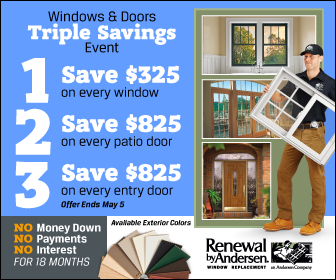 Renewal by Andersen of St. Louis is the leading source of patio doors and door installation services in St. Louis, MO.